Il Ballo Tiepolo®, a not to be missed international social gathering of the carnival of Venice since 1998. 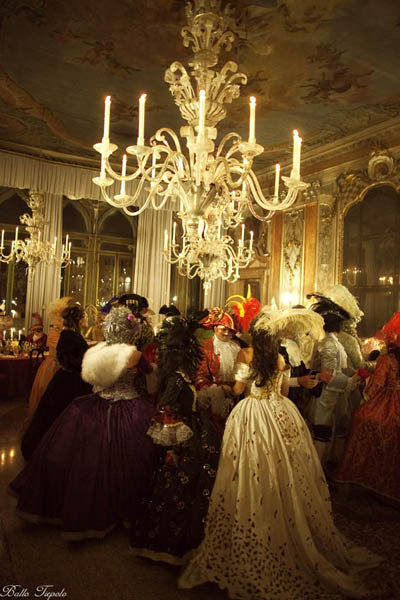 The Ball holds all the sophistication, splendor and magic of the carnival balls of the Eighteenth Century, and there isn’t a better location to hold the Ball than Pisani Moretta palace, located on the Grand Canal and lit up by hundreds of candles. The guests, upon their arrival, will be welcomed with extraordinary appetizers and drinks on the ground floor, and then they will be guided to the noble floor to enjoy the dinner, all created by our Michelin star chef. The baroque orchestra will entertain the guests throughout the evening, as the opera singers and the Dance Masters, who will transform part of the main hall of the noble floor into a dance floor from the 1700s, teaching the basic steps of the period group dances to the guests. Moreover, acrobats, actors of the Comedy of Art and other performers will move through the different rooms of the first floor to surprise the guests during dinner. After midnight the grand ball will continue on the ground floor with a music ensemble, the Dance Master and a buffet with Venetian sweets and Prosecco wine. The palace, overlooking the Grand Canal, is a magnificent example of late gothic architecture (end of 15th century), and after several restorations and decorations throughout the years, is today one of the most beautiful palaces in Venice. The architectural importance of the façade, framed by the splendid Gothic mullioned windows of the two main floors, conceals wonderfully elaborate Baroque decorations inside with the works of the most outstanding Venetian artists of the 18th Century such as Giambattista Tiepolo, Jacopo Guarana, Gaspare Diziani and Giuseppe Angeli.